Come along to see and hear us? If you are thinking that you’d like to hear and see what The Rivertones sound like (and look like in the flesh!! ), with a view to joining us - or booking us for that very special unusual treat for a birthday, anniversary, wedding or any 'special' event you can think of - then please come along, relax, sit back and have a listen to us. There is no pressure or commitment to anything by visiting us. Weekly rehearsals begin at 7:00pm. The start of the evening usually involves a vocal warm-up. New songs are practised sometimes with section rehearsals. We have a short break usually around 8.30pm during which any business is addressed. The rehearsal continues from 8.45pm until 9.45pm with songs from our repertoire. During this time we could talk to you personally to hear of your thoughts and ask if you’d like to learn to sing with the chorus or you may have come along just to get a flavour of what we sound like. We could help you to find out if you are a lead or tenor, bass or baritone, either on your first visit or later on. We can also provide you with a folder containing the music of our repertoire to help you follow what we are singing, although you don't need to be able to read music to become one of The Rivertones. It’s completely up to you! If you return, we will give you a voice assessment, which is nothing scary, and offer you a set of teaching materials of words, music and teach tracks. These methods are used by the singers to learn their parts. Each section (lead, tenor, bass and baritone has a section leader who will support you during your voice assessment and in the future. If you have any questions regarding membership or an enquiry regarding a visit please use our Contact form or alternatively ring Kevin Toller, our Membership Secretary, on 01823 490109. For any enquiries regarding a booking please ring our Bookings Officer/Singout Secretary Graham Blight on 01823 461229. 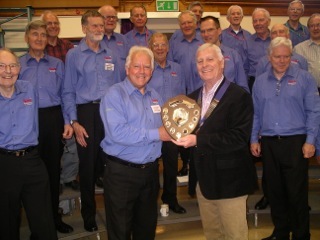 The Rivertones receiving the Tony Foster Shield for the period 2012/2013 from Colin Bennett, Chairman of the British Association of Barbershop Singers (BABS). The award is presented each year at the BABS annual convention and is given to the chorus who has recruited the highest amount of new members in one year. The Rivertones are shown winning the Tony Foster Shield yet again for 2016/2017 - the first chorus in Great Britain to have won the award for a second time. 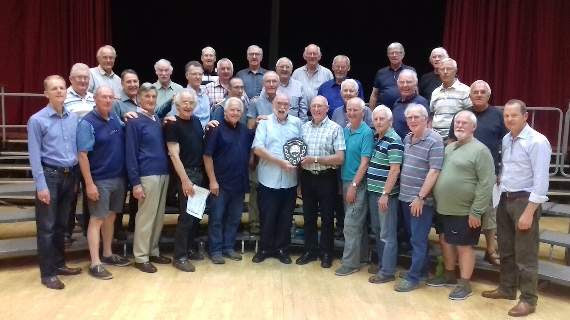 Colin Harlow (involved in setting up the original Learn To Sing course which has now been adopted throughout BABS, and also used by choirs throughout the country) is seen holding the award with Allen Day (Membership Secretary), with other Rivertones looking on.